There’s a place where people curious about wine go when they’re looking to relax and enjoy interesting bottles. And that place is the long-standing East India Company. 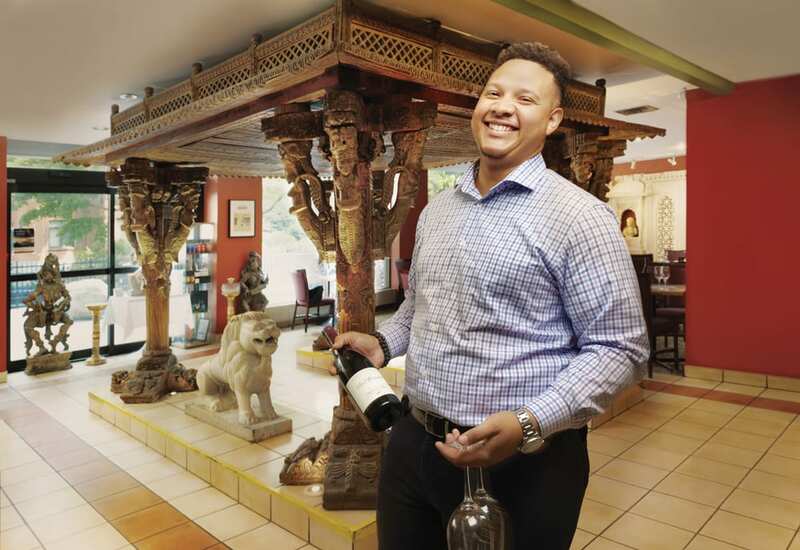 While many turn to beer when eating Indian food, Bernard Joseph-Lemoyne wants you to keep an open mind and consider his wine list. Here, the sommelier talks about starting out in the business, developing his palate, and what to buy if you’re cooking up a curry. I’m not a huge fan of formal university, but when I got to Algonquin, there was such a practical aspect to it with the wine tasting, the food-and-wine matching. After Algonquin, I starting pursuing the Court of Master Sommeliers. It’s very much self-study, so the sommeliers within the community that have gone through it help each other out through things like tasting groups. The sommeliers seem like a very tight-knit community. Is that unique to Ottawa? I think it is. In comparison to larger cities like Toronto or Montreal, where there is more of a competitive edge, in Ottawa it’s more fraternal — we lean on each other. What do you look for when choosing wine? It’s fun, because no one knows what to expect! I’m very fortunate that the kitchen’s approach is one that’s very understanding of palate. They’re not looking to burn your mouth. I look at spice as a texturizing element, and it has to be balanced. So I look for that in my wines: balance. Loosely, I’d say not overly tannic reds and not overly oaked whites. But mostly just fresh, delicious wine. What would you like people to know when it comes to pairing wine with Indian food? Keep an open mind. A lot of work goes into both the food and the wine. What’s one of your favourite pairings from the East India lineup? We have a puréed eggplant dish that is amazing. With that dish, if I was going to go red, a Pinot Noir by Tantalus in British Columbia. It has this florality to it while keeping a very strong fruit profile. The dish itself is texturally quite smooth but has tons of flavour. If I was going to go white with the same dish, I have a wine by Hervé Souhaut of France called Romaneaux-Destezet. It would match the dish, texturally, perfectly. For those who like the spiciness of Indian food, what wines would you suggest? For spicier dishes, wine is still definitely an option. Sparkling wine would be a great choice — something with more extended lees aging, as that adds a bit more structure to the wine. A favourite of mine is Benoit Gauthier’s Brut Vouvray, 100 per cent Chenin Blanc from the Loire Valley in France; it has a very faint touch of sweetness that helps combat the heat, while the bubbles act as a palate cleanser. Other options include rich whites like Alsatian Gewürztraminer or Viognier from California. For red, Australian Grenache or Valpolicella Ripasso. What wine goes with gulab jamun? I’ve had a lot of fun experimenting with this, and the go-to seems to be port. Indian desserts can be very sweet, so a like pairing makes sense. However, I enjoy sweet sherry such as Cesar Florido’s Moscatel Dorido — it’s sweet but with great acidity, keeping the wine in balance. A non-fortified and not-as-sweet option would be the Cave Spring Indian Summer Late Harvest Riesling; it’s not as sweet as icewine but still fantastic and versatile with dessert. For gulab jamun specifically, Moscato d’Asti is great. Is there a winemaking industry in India? There is, and we used to see some of these wines in the LCBO. The most recognized producer is Sula in northwest India, producing wines from international grape varieties like Sauvignon Blanc. Sadly, they are no longer available in Ontario. Complex wine with ripe red cherry and raspberry complimented by florality, earthiness, and sweet spice on the finish. This matches the delicate complexity of the dish beautifully. From the northern Rhone, this 100% Syrah is a blend of fruit from various plots that are farmed organically and biodynamically. The wine is rich in dark fruit, pepper, and sweet spice, with a velvety texture. Made in the Methode Champenoise from Chardonnay and Chardonnay Musque. Density of flavour highlighted by rich toastiness (a result of extended lees aging upwards of 30 months), fresh green apple, and river rock. Excellent value.